Departing Suffolk and Essex - Visit the tallest building in Western Europe, The View From The Shard offers unrivalled 360 degree panoramic views of London, stretching for over 40 miles. See London light up as you visit the shard late afternoon. Before visiting The Shard enjoy a two course late lunch at Cafe Rouge. Visit the tallest building in Western Europe, The View From The Shard offers unrivalled 360 degree panoramic views of London, stretching for over 40 miles. 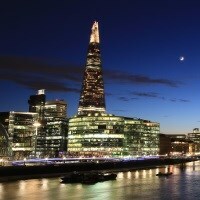 See London light up as you visit the shard late afternoon. Demi Poulet -half a roast chicken marinated in garlic and herbs, served with thyme jus and frites. Poisson Frites - sustainably sourced breaded hake fillet with frites and pea and mint puree. Tagine - Moroccan style stew of butternut squash, carrots, spinach, chickpeas and courgettes, seasoned with rasel hanout, harissa and coriandar, finished with toasted almonds. Creme Brulee - Vanilla creme with caramalised top. Tarte Au Citron - Lemon Tart and creme fraiche. Creme Glacees - Your choice of Vanilla, Chocolate, Strawberry, tarte tatin, salted caramel ice cream. Mr & Mrs L: "Great day out. Claire wonderful tour guide."